A great advantage of spending time in Sun Valley is that it is one of the West’s great art destinations. 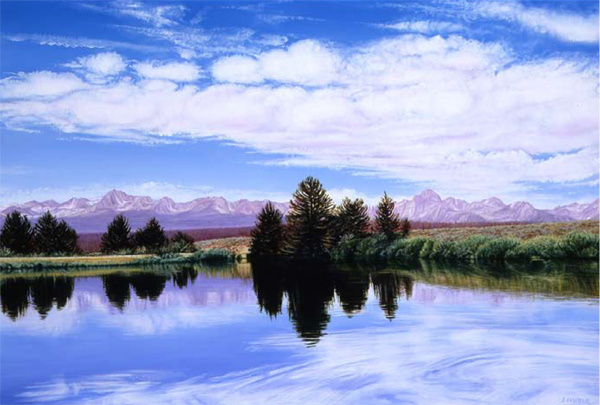 Anchored by the strength of the Sun Valley Center for the Arts and energized by galleries that are of the same caliber as found in the major cities of the world, the art of the Wood River Valley can rejuvenate and sustain the spirit. In a world of superficial distractions, great art touches something very deep and reaches universal truths to unite us as people. Experiencing great art is like a spa for the spirit that rejuvenates, heals, and enables us to move forward. As evidence of how strongly members of the local community have embraced the importance of art in their lives, they have formed a number of non-profit groups and the City of Ketchum has a vibrant public art program. Long-time Ketchum resident Gail Severn is active in this volunteer community and observes, “Art here is readily accessible and there is a warmth and welcome to the experience.” An example of the accessibility is the Fourth Street Art Corridor, where every spring through fall four blocks along Ketchum’s Fourth Street are lined with sculptures from the various galleries. The activities of the Wood River Arts Alliance, the Arts Foundation for the Wood River Valley, Sun Valley Performing Arts, the Ketchum Arts Commission, and the Sun Valley Gallery Association are all worth checking out through their websites and publications. The Sun Valley Gallery Association sponsors nine free Gallery Walks each year, where the participating galleries open their doors, offer wine and refreshments, and often feature newly installed art and have the artists present. The Sun Valley Center for the Arts is an active participant, and nvites people to start the Gallery Walk at their gallery. The Ketchum Arts Commission and City of Ketchum sponsor the public art exhibits. Winter and snow aren’t obstacles for enjoying the outdoor art; some exhibits look even lovelier, and additionally, there are a number of pieces on the 4th Avenue Art Corridor that will remain up for the winter and are convenient to view while running errands in Ketchum. “The Kagan Park installation next to the YMCA is the largest of Ketchum’s installations, and it is easily accessed, as is the park behind Ciros, where a piece by Delos Van Earl can be seen,” describes Gail Severn, a member of the Ketchum Arts Commission. “The Kagen Family donated the large grouping of steel sculptures in memory of one of Ketchum’s most well-recognized artists, Rod Kagan, who passed away last year. Rod created these pieces in part from old wheels, pulleys, gears, and other parts from mines near Ketchum. Rod’s work is featured in museums throughout the country, and it is a real achievement for the City of Ketchum to have such a wonderful, large-scale installation in town to share with the public.” There are a number of special events, like the Plein Air Exhibition, where artists can be seen with their easels and paint boxes capturing the scenes of the countryside, and Labor Day when a number of the galleries have special shows. Here are some of the special upcoming winter and spring events at selected galleries. Founded in 1971, the community-supported Center aims to provoke and stimulate the imagination while opening hearts and minds through excellence in diverse arts programming. December through February 4, 2012, the Center presents “Journeys in Polar Regions,” a multidisciplinary project examining the role the Polar Regions play in our understanding of our world through the lens of travels and expeditions. As is the practice of the Center, a series of guests will make presentations on the subject during the exhibit’s run. Gretel Ehrlich will lecture on her recent book The Empire of Ice: Encounters in a Changing Landscape. Filmmaker Werner Herzog appears with his film, Encounters at the End of the World. Also, award- winning photographer, James Balog, presents stories and his photographic survey, Thin Ice: Journeys in Rolar Regions. Other upcoming presentations are music from Chad; best-selling author of No god but God: The Origins, Evolution and future of Islam, Reza Aslam; a flamenco performance and workshop; an appearance by writer, wit, and radio host, Garrison Keillor; and Irish music by Dervish. For dates, times, and locations, check the Art Center website calendar. Gail Severn Gallery spans over 11,000 square feet, and is comprised of four distinctly different spaces that allow for a wide range of exhibitions. This winter, viewers will see a mix of emerging, national and internationally recognized artists. February features the newest work of Kris Cox, whose layered and sculpted surfaces explore the symbolic notion of time. The western landscapes by rancher and noted artist Theodore Waddell also open in February, and his impasto canvases are enlivened by his long connection to the land, horses and cattle. Gilman Contemporary presents 10 exhibitions throughout the year and represents emerging to mid-career artists with an innovative vision. Beginning December and running through the end of January are paintings by the Kollabs, a collaboration of artists Anke Schofield and Luis Garcia-Nerey. In February, Stephanie Weber’s aluminum panels present linear logical forms that strike an emotional chord. Jane Maxwell’s March through mid April show focuses on the female form, and in doing so explores issues of women, body image, and the feminine ideal. The Aboriginal art movement of Australia comes to Ketchum in this gallery. The gallery owners collect pieces from artists in remote townships, and they are available to explain the connections to culture, spirituality, and the land, although the beauty of the pieces stand on their own. “BIRRKU” Treasures from a Distant Land opens with a special ceremony on December 30th that includes performances of traditional songs and dance accompanied by the yidaki (didgeridoo) by visiting artist Wukun Wanambi. On Saturday, December 31, the artist will explain the cultural imagery and stories connected to his bark paintings and ceremonial poles. Relatedly is a film presentation, A Yolungu World, at the Community Library in Ketchum on Thursday, December 29th. Mid February, a new show opens timed with the Gallery Walk, the Papunya Tula Artists. It celebrates 40 years of art from the western desert region. A fundraiser for the medical care of aging artists occurs a day prior to the exhibition opening. March exhibits include the animal-image paintings of Robert McCauley, and a group showing of tapestries where every color and detail is the result of the interaction of the colored threads that comprise the object in an exhibit entitled, “The Eloquence of Trees.” Featured artists in this show include: Squeak Carnwath, Donald and Era Farnsworth, April Gornik, Robert Kushner, Hung Liu, Andy Diaz Hope, and Laurel Roth. Noted outdoor photographer and Ketchum resident David R. Stoecklein displays images that capture the western way of life at his gallery and studio. In addition to signed prints, the gallery features his numerous photography books, calendars, and notecards. For those who have admired his work at a distance, Stoecklein is offering photography workshops this winter and spring at a number of western ranches. At the workshop, attendees have the opportunity to work with him as he shoots photos of cowboys and cowgirls at working ranches and the surrounding scenery and to capture their own images with the master’s guidance. More information may be obtained by contacting Tessa Sheehan at the gallery. sfP | stephanie freid-Perenchio studio Stephanie Freid-Perenchio, a humanitarian documentary photographer, opened her Ketchum studio in 2009. She envisioned a place where people could not only experience her photographs, but also gather to discuss current social justice issues. Her current exhibit, Moments Captured, runs until March and showcases Stephanie’s past ten years behind the lens. From behind-the-scenes images of SEAL training, to detention centers and prison life in Afghanistan, to tribal and wildlife in East Africa, to the winter work of the American cowboy, Stephanie’s photographs explore worlds very few of us are able to witness first hand.